It’s definitely Chelsea’s week this week, what with Chelsea Flower Show and Chelsea in Bloom, so it might be a good moment to mention Peter Jones Ladies…. (Peter Jones is a branch of John Lewis). Where New York has Advanced Style, London has Peter Jones Ladies; thoroughly British and with a very distinct style of their own, they are mostly found visiting Peter Jones in Sloane Square, the heart of Chelsea. 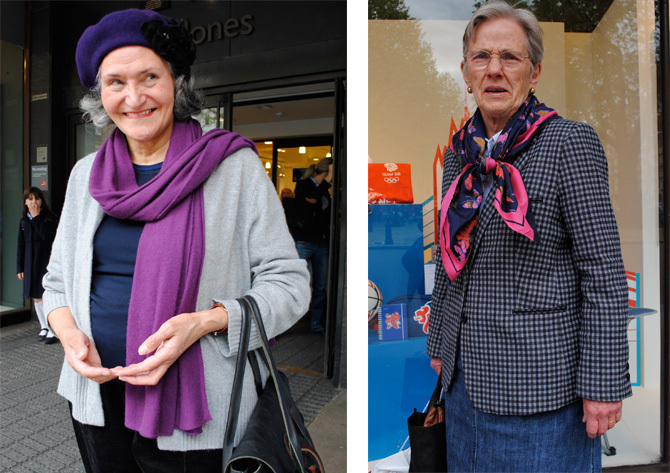 Often found wearing a well tailored or quilted jacket and good jewellery (they love a pearl necklace) they also have a strong sense of colour and know the importance of a coordinated scarf and ‘done’ hair. 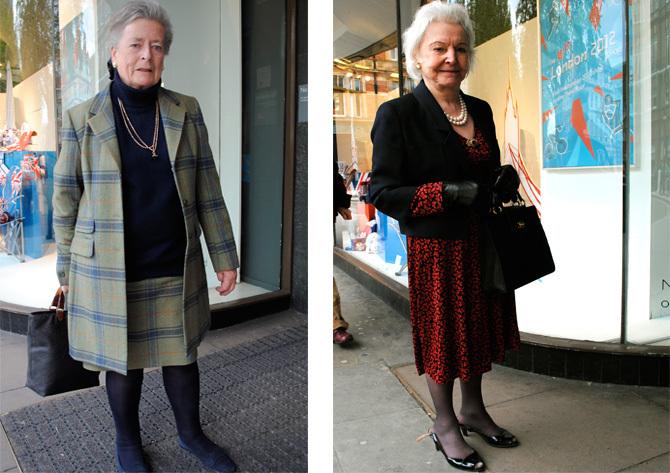 And for once it is the slightly older women that really rock the look, using fabrics such as British tweeds, checks and velvet teamed with a solidly sensible shoe, leather gloves and of course a jolly useful handbag. Never fashion trend followers they are, I suspect, more concerned with looking elegant, smart and generally ‘well turned out’ and there’s more than a hint of The Queen’s style (see yesterday’s post) there too. 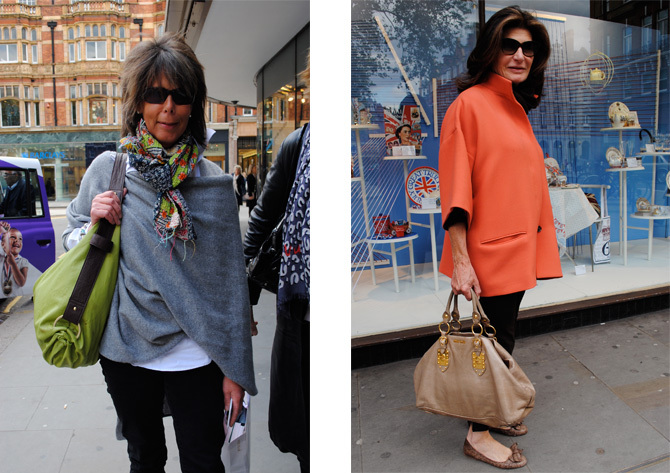 I snapped a few outside Peter Jones last week looking fab. 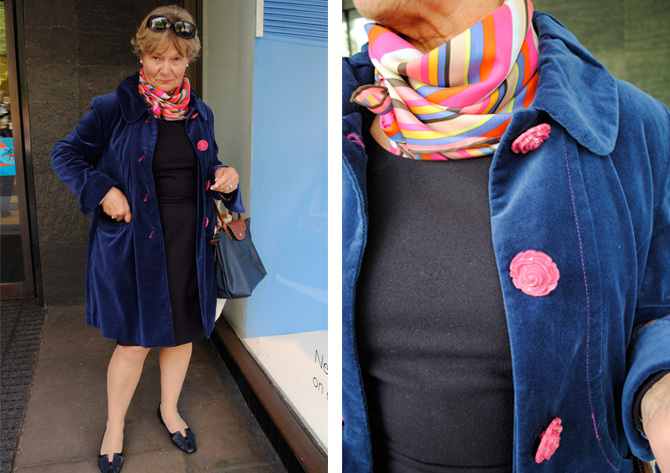 This lady (above) wore my favourite outfit of the day, a velvet royal blue coat with carved floral buttons in geranium pink, artfully accessorised with a colouful striped silk square. The pale tights and square-point shoes are a masterstroke. Did I mention PJ ladies have a ‘no-nonsense’ attitude? You’d want them on your side if there was trouble. 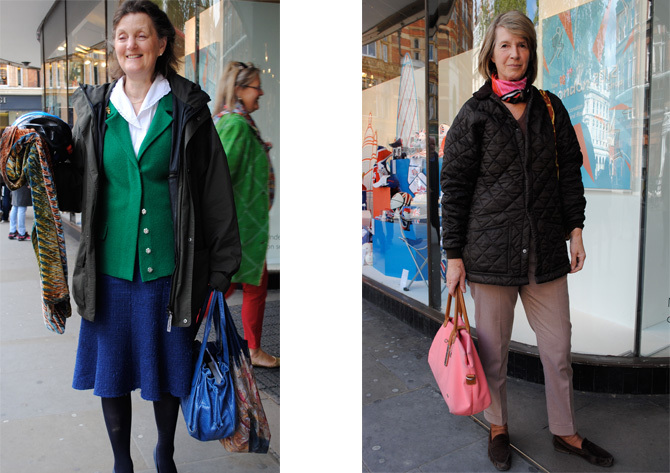 The quilted/padded jacket and Barbour are essential in the PJL wardrobe, but look at how these two ladies above use colour in accessories to liven-up even a casual look, love that green cardi-jacket and those mink tailored trousers are the perfect fit and length for showing off long legs and great shoes. modern PJ ladies, including the essential bicycle! Modern, trousered PJ ladies here above, on the left the neat version of the quilted jacket is ‘an old one from Max Mara’ and the bicycle is perhaps the preferred method of transport for PJ ladies, particularly in the countryside. Note the up-from-the-face hair, PJ ladies used to favour a hairband, this is much chic-er. Loving this colour masterclass here -the grooming is everything too! Great use of colour again here, and I really love the lady on the right with her slightly androgynous hair and jacket lifted with a shot of print and colour from the scarf. This lady above told me she used to be a ballerina – she had excellent deportment and it explained her dancer-chic hair . Get a good tailored jacket that will smarten up everything you put it over, if it’s winter -ditto for coats. Use scarves to add colour, interest and texture to every outfit -never be without one! Good jewellery adds gravitas -pearls and a bit of inherited gold should do it. Marvellous shoes – ballet-flats, suede or leather, buckled, generally sensible but also chic. Silver and grey hair is positively encouraged, but must be groomed. You can never have too many quilted jackets, but be modern with your choice and ensure they fit…no slouching! Come back tomorrow where we’ll be looking at the amazing floral window displays Chelsea retailers have done to celebrate Chelsea in Bloom! Are they not just typical of their age and the Chelsea environment? Mothers to the Sloane Rangers of the 80s? Not sure Peter Jones is much to do with it, they’d dress like that regardless. 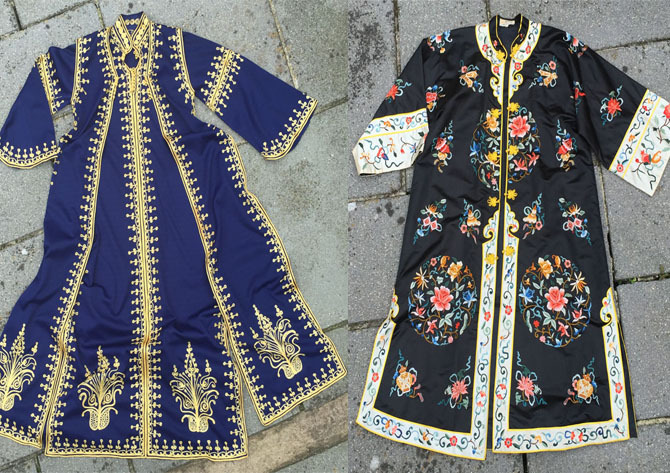 I do love that blue coat with the carved buttons and the scarf though. Most stylish, least ‘tribal’ of all the pics I think. 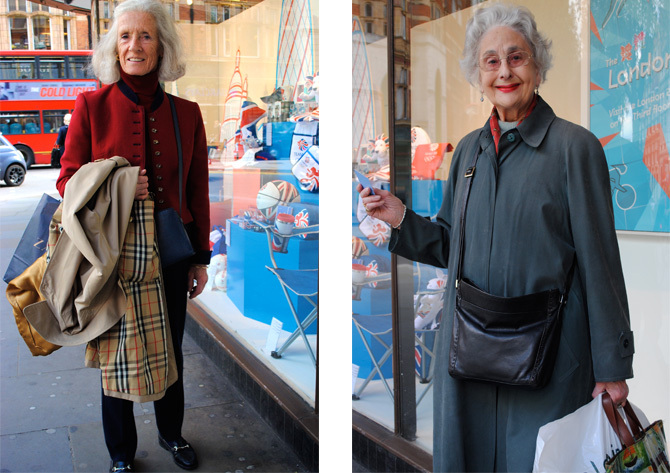 I also love these – seeing slightly older ladies with a good sense of their own style is great. 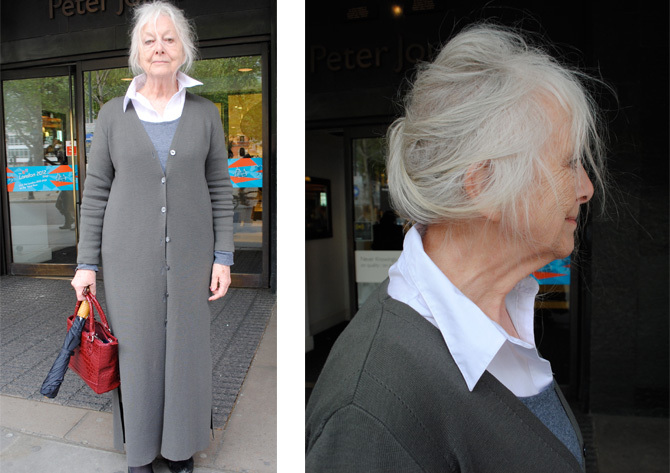 I did one of the V&A’s art history courses and it was well populated by the more boho end of PJL lady. I have also realised that I assume a good cardi/jacket/coat + cowl/scarf/wrap will hide a multitude of sins and instantly turn me into a stylish person, or at least someone who isn’t a total eyesore! I have a bit of a penchant for hats too ;-) Crikey, I may turn into a PJL lady in time. So lovely to see ladies of a certain age oozing style grace and confidence, although it must be remembered they were taught well by their mothers in a pre-lycra tracksuited age where you would never dream of going out in your pyjamas which I have witnessed in a supermarket recently. 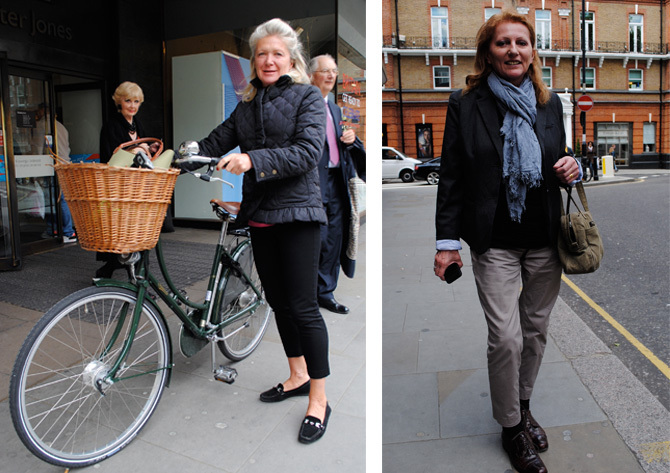 I love the cycling lady, very town and country! The blue velvet with pink rose buttons is from a lovely Scottish shop called Ness. Andy Murray’s mum famously wore one of their coats to Wimbledon last year, and it was the first time she had been asked about her outfit!